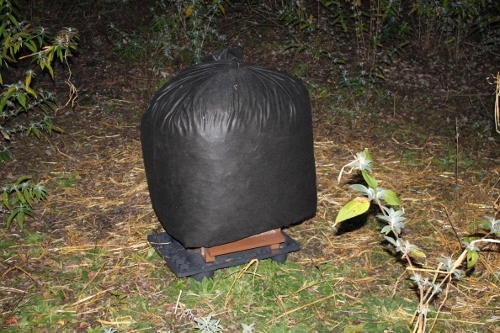 I find top entrances anti-natural and against all of my experience with natural beekeeping. Just to say it crystall-clear. 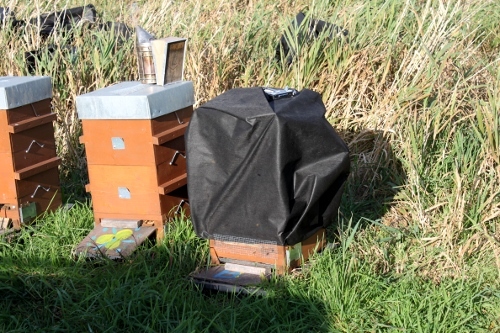 It is completely turning over the hive's climate and the bees ability to control it. I am not saying a top vent (not entrance!) is helpful at times, but most of the time it is destroying the natural hive nest scent and the way of air flow in the hive. By the way top entrance is not "ventilation" bees can still build front comb in a way to modify the amount of humidity or heat leaving the hive but Im yet to observe that in my hives. If pheromones/hive scents are heavier than air than they will sink to the bottom as organic acids from honey production do. With a bottom entrance these leak out easily but not so with a top one. Im not saying one is better than the other one! Im only sharing my experience with top entrances in horizontal top bar hives. Im sure condenser hive is a GREAT idea for hot countries which dont get much rain but in my locality that is never an issue. Any who Im off to Sweden to move my bees to our farm in Denmark ) see you all soon! Ta ta! Gonna be a nice warm day, with 23 degree Celsius. Bees started to collect water in the early morning hours. For me this another example for the Bien being a thinking and planning creature. They do not simply react, but actually prepare for the hot day. Posted: Sun Apr 20, 2014 12:09 pm Post subject: condensation plate? I'm thinking that a small condensation plate in the north side of each box might be useful? 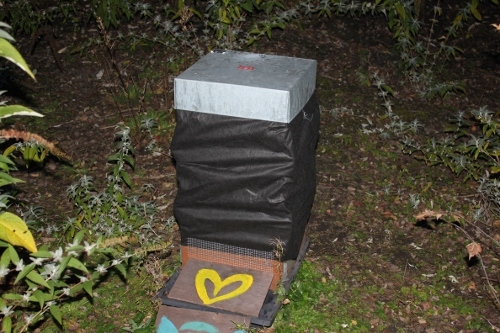 A small 3cmx 3cm L shaped piece of metal on the inside, bolted through to a metal plate on the north face of the hive. The cold plate on the outside would cool the bolts and the inner plate through conduction? If this was combined with really good insulation generally? The part about close to ground level he explains on the next page as being an error due entirely to observational bias in sampling. Again I ask: Why keep beating this thoroughly dead horse? It's not going to get up and trot! You remind me of the proprietor in the Monty Python Pet Shop skit with the irate customer's recently purchased—and dead— parrot (IT'S DEFINITELY NOT IN THE PINK!!) Google it—you'll love it. Gotta admire your tenacity nevertheless. SPIVAK, MARLA; ZELTZER, ABBIE; DEGRANDI-HOFFMAN, GLORIA; MARTIN, JOSEPH H.
"Queens are significantly darker when held at constant temperatures of 30.5°C during the last instar and pupal stages compared to 35.5°C." "This study and that of Spivak et al (1992) demonstrated that the expression of genes for color is modulated by constant temperatures." The mean hourly Pw, in the nectar store is always below 20 mb whereas in the brood nest it is above 20 mb. VPD in the nectar store shows greater fluctuation with a peak between 12:00 pm and 16:00 pm. The fluctuations in the nectar store are due to changes in temperature and are not driven by vapour pressure, as this remains fairly constant throughout the day. It would be most efficient for workers to evaporate nectar during the VPD peak, however VPD in the nectar store remains higher than ambient at all times during the day. This explains why honeybees remain inside the hive to evaporate nectar rather than doing this outside the colony. We need to look deeper at vapor pressure inside the hive. Seems, there is a different vapor pressure in the broodnest and honey comb. Also another thought: does the mite react to pressure? Would be a nice thing to knock down mites by changing the pressure inside the hive. Trying different winters etups at the moment. 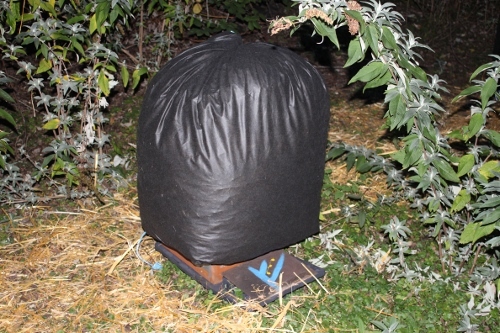 To see, how my super-insulated arctic hives compare to other setups. I am testing three types of insulation: 1. no insulation 2. wrapping with black fleece and 3. super-insulation. 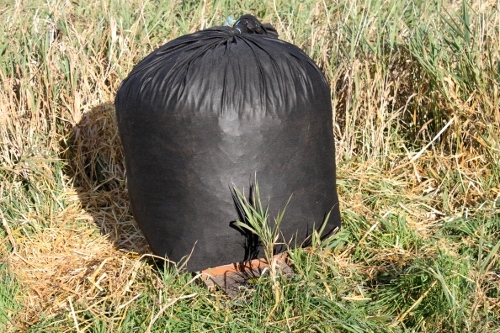 I sewed a black fleece that is used to cover compost into a long tube, upper and lower end open. Pulled that tube over the hive, stapled and strapped it at the bottom end. Stuffed it with straw and closed it up at the top. The thickness of the straw wall is about 15-20 cm. 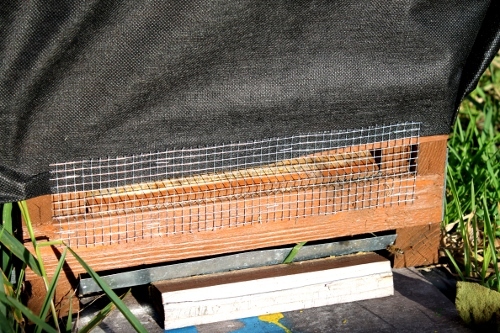 The mesh, that is used to prevent mice from entering the hive, also fixates the fleece, so it doesn't drop before the entrance, so the bees don't suffocate. The fleece gets stapled to the entrance. Looks a bit crazy, but are very warm and cosy. In the sun, the whole thing warms up nicely. After a rain, the straw is damp, but dries up quickly. That is the other type, just wrapped, no insulation. And this another setup where I folded the wrap under the roof. This is the quickest setup, just fold, staple, done. There is no insulation with this setup. Just some solar gain and blockage of wind. Those are the controls, which do not get any insulation or wrapping. Just a mesh against mice. 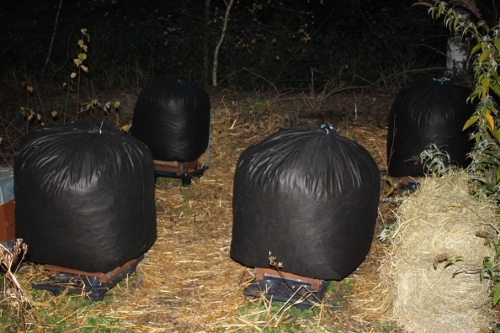 This year I took the exact weight of all hives, so can compare how much winter food they use in each setup. I've spent two days reading this very informative thread. Now, an embarrassing question or two: I am a newbeek---lost my first cutout this past fall. Am spending the winter reading and studying as I prepare for a swarm this coming season (I hope..). I have a Warre' hive. I am way too stupid to follow all the math on this thread, but want dearly to provide a good home for my bees. What would be the simplest solution to the condensation issues for my hive? I'm no carpenter, but I believe I could construct Berhard's condensation "roof"/bee feeder. Should I stick a stone slab in this sub-roof thingy? My hive box is already heavily propolized from last year's bees. I can make a small entrance and keep a solid floor. I can tilt the hive to one side. Can I construct some kind of a simple deep floor for a Warre' hive? Should I just stick to keeping calendars of bees, instead of real bees?? I don't want to do them more harm than good. If one wants condensation, could one not simply place a layer of glass in place of a Crown Board or Quilt for the summer? And take it off for the winter where there would be too much condensation? I reckon there are some key elements in this article to understand the Bien as a whole - and problems made by beekeepers, pesticides and environment. I think the article is a key to a deeper understanding of the Bien and many observations I made completely fit into the picture of the hypothesis of this article. There is not much really new in it besides it summarizes things and adds the "double repressor hypothesis". Don't know if it is just me, but I am thrilled. This is the description on how the inner Bien gets in harmony with it's outer environment. Ich habe mich stets gefragt, weshalb die wilden Bienenvölker in den Baumhöhlen in Frankreich, USA, ... die Varroa jahrelang überleben. Und warum sie, sobald sie in Bienenbeuten transferiert werden, dort an der Varroa eingehen. Vent , or maybe you have in another tread ? I am adding more insulation now. At the top the thickest insulation. Starting to think, that more insulation all around the Bien would be good, but you need to regulate the ventilation then. Thanks for posting the link to this interesting research article. It just reiterates how little we know of normal bee behaviour in the wild, and the fact that bees survive despite what beekeepers do to them. Thanks for posting Madasafish. I know Paul the author of the article. He has Warre hives. I think better insulation and less heat loss is definitely the way forward. My good beekeeper friend from Srbia (Europe) more than 20 years didn't use any treatment agains varoa. His hives (mostli LR but also his special nukleus) have round entrance at the top of the hive if there are two boxes (bodies). 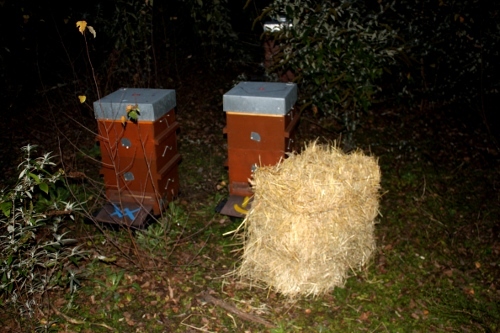 Here are two of his very old hives (and he did not change the comb in brood area last twenty years that's why it is very dark. You can see the white small tube - there is a temperature sensor inside. 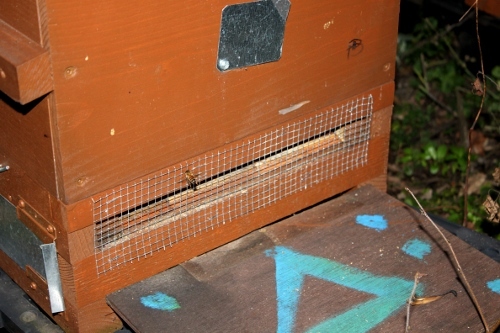 He found out that colonies in hives with round entrance (AND without classical horizontal entrance at the bottom) can maintain averagely 1°C higher temperature in the nest which is 'problem' for varoa. 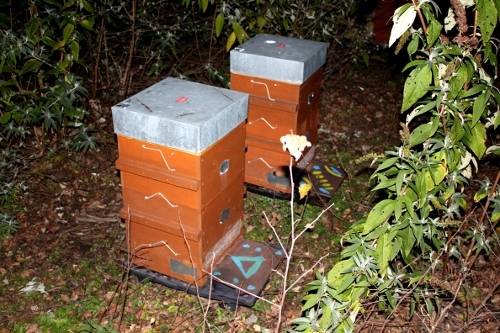 The worst combination for microclime in the hive is combination of horizontal entrance at the buttom and (or mesh floor) onother one at the top . So: NO ventilation, ONLY good microclime in the hive. 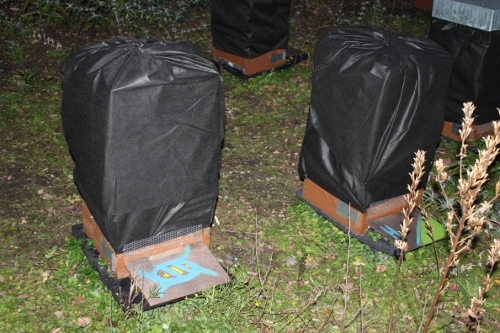 He also performed serial measurment of temperature and CO2 in the hives and found out the round entrance is the best way to enable (help) bees keeping optimal microclime in the hive. And it's not true that warm air is (always) at the top of the hive . You can check at your own hives.